27-10-2006 2:10 pm Twenty-five new sites, including one transboundary reserve straddling Spain and Morocco, have been added to the global Network of UNESCO’s Man and the Biosphere (MAB) Programme, which has been pioneering the practice of sustainable development on a scientific basis for over 30 years. Eighteen of these new reserves are located in Mexico, three in Spain and one each in the Russian Federation, Viet Nam and Malawi. Extensions or changes to four existing biosphere reserves have also been approved. The Network now numbers 507 reserves in 102 countries. Biosphere Reserves are places recognized under MAB where local communities are actively involved in governance and management, research, education, training and monitoring, promoting both socio-economic development and biodiversity conservation. The additions and changes to the World Network of Biosphere Reserves, illustrate its vitality and continuous efforts made to improve its quality. Cumbres de Monterrey, Mexico, is of particular interest due to the economic value of some of its plants species and to the role it plays in ensuring water supply to nearby urban areas of Monterrey. The reserve is very important for the preservation of bird species and for its abundant oak forests. Huatulco, Mexico, on the Pacific coast of the Oaxaca Province in the South of Mexico, has a high variety of natural resources that range from tropical dry forests to coral reefs. It is of great value for the protection of both terrestrial and marine resources, which include turtles, dolphins and caracol púrpura (purple snail). La Encrucijada, Mexico, on the Pacific coast of the State of Chiapas, features remarkable lagoons, terrestrial and marine resources. Eleven rivers and their tributaries merge with sea water to form the reserve’s lagoons where shrimp fishing is widely practiced. High human pressure on natural resources has led the Mexican authorities to establish this reserve to protect its mosaic of wetlands and coastal areas. La Primavera, Mexico, located in the State of Jalisco, features forests – mainly pine and oak - of high value for the supply of both water and wood to the city of Guadalajara. The reserve, a genetic reservoir and biological corridor between the area’s various systems, contributes to maintaining genetic and biological diversity and to sustaining evolutionary processes. La Sepultura, Mexico, in the Chiapas in the South of Mexico, is of interest due to the rich variety of its forests and land-use. The reserve is home to eight of the Chiapas 18 primeval vegetation types and also features remnants of pre-Colombian cultures, such as the Olmec. 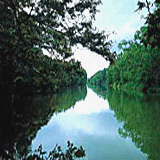 Laguna Madre and Rio Bravo Delta, Mexico, in the Northeast of the country, on the Caribbean shoreline, has high variety of tropical and coastal forests, including mangroves. In the mosaic of different ecosystems there are also dunes and wetlands with endemic turtle species. It is a natural corridor for migrating water fowl and is home to many species of beach birds. An ecological management plan was needed for the area to mitigate the stress caused by human impact on natural resources. Los Tuxtlas, Mexico, presents a high complexity of ecological, geological and human impacts. It has one of the highest biodiversities of Mexico with wet tropical rainforests stretching over three volcanoes in the central part of Mexico, in the State of Veracruz on the Caribbean coast. Indigenous Popolucas and Nahuas inhabit this area where some of the earliest human settlements of Mesoamerica have been found. Maderas del Carmen, Coahuila, Mexico, comprises part of the Eastern Sierra Madre. Its altitude, geographic particularities and interconnections have allowed for the sustaining of numerous flora and fauna species typical of the Chihuahua desert and of the Eastern Sierra Madre. Of high biodiversity, the site is contiguous to the Big Bend National Park and Biosphere Reserve on the U.S. side of the border. Its designation as a Biosphere reserve should encourage ongoing transboundary co-operation. The biosphere encompasses large parts of the Chihuahuan Desert. Mariposa Monarca, Mexico, is of outstanding value for the protection of the Monarch butterfly, which migrates from North America to this site every year. Therefore, there is strong co-operation with the Canadian and U.S. authorities responsible for key sites along its migratory routes. The arrival of the Monarch butterfly attracts large numbers of tourist numbers, providing considerable income for the local population. Pantanos de Centla, Mexico. The important protection of water resources on the site, in the State of Tabasco, is the fruit of millennial cultural practices. Village populations in the transition area of this site are very much involved in its management and are very aware of the reserve’s wealth as they use some 200 flora species. Selva El Ocote, Mexico, in the Chiapas in the South of the country, is home to large tropical rain forests. It also features a large number of cave formations with many endemic species. Furthermore, it has karstic aquifers that constitute a freshwater reservoir of 600 million cubic metres. Sierra de Huautla, Mexico, in the State of Morelos, at an altitude of 700 to 2,240 metres above sea level, features large fir forests and has some very interesting butterfly species, relicts from more humid and warm periods. Local participation in the management of the site is important, notably for the protection of natural resources, including its large number of endemic species. Volcan Tacana, Mexico, in the Chiapas, on the Guatamalan border, has particular value due to local participation in the management and protection of natural resources and fragile ecosystems of the reserve. The biosphere reserve is important for the development of poor rural population. The existence of a national park on the Guatemalan side, should facilitate transboundary cooperation. Arrecife Alacranes, Mexico, the largest coral reef in the Gulf of Mexico, is also the only coral reef in Yucatan. Beside its great biological diversity and fishing potential, the reserve is also of cultural value due to the presence of many historic shipwrecks and monuments. It consists of a marine park and areas on the shore whose inhabitants have an impact on the marine areas. Barranca de Metztilan, Mexico, in the dry central area of the State of Hidalgo, can be considered as a Pleistocene refuge of the Mexican desert biota and its relationship with the Chihuahuan and Sonora deserts. The landscape of the reserve is impressive, marked by the presence of cacti that are several metres tall. Five indigenous Otomi communities inhabit this area. Chamela-Cuixmala, Mexico, on the Pacific coast of Mexico, features a high variety of tropical forests where there is a strong relationship between island, sea and terrestrial activities. The reserve is home to five species of marine turtles, the green iguana lizard and river crocodile. Cuatrocienagas, Mexico, in the ecoregion of the Chihuahua desert of the Mexican Highlands, features close to 500 pozas, pools whose turquoise waters come from underground sources. The exceptional wealth of endemic species in the reserve has led observers to compare it to the Galapagos Islands. Sistema Arrecifal Veracruzano, Mexico, consists of numerous islands near the Caribbean coast that are grouped in a national park. The reserve is of particular value for the protection of coastal and island resources in the vicinity of the town of Veracruz. Middle Volga Integrated Biosphere Reserve, Russian Federation, represents a 150,000-ha “island of nature” formed by a loop of the Volga River within the industrial area of the centre of the Samara-Togliatti agglomeration. Consisting of a national park and municipal areas, the reserve’s landscape is very varied, consisting of ecosystems in various stages of transformation due to human impact. It also features a great biodiversity, notably 30 moss, 130 lichen, and 300 vertebrate species, some living close to agricultural land and urban buildings. Os Ancares Lucenses y Montes de Cervantes, Navia y Becerrea, Spain, is a new reserve of great biogeographic importance that complements significantly the existing biosphere reserve complex of the Gran Reserva de la Biosfera de la Cordillera Cantabrica. It also neighbours the Terras do Mino biosphere reserve. Together with the other new reserve, Los Ancares Leoneses, the size of the future Gran Cantabrica biosphere reserve will extend over more than 900,000 ha. Of particular importance in this site is the protection of the Cantabric bear, Ursus arctos. Los Ancares Leoneses, Spain, is also a new important complementary unit to the existing biosphere reserve complex - Gran Reserva de la Biosfera de la Cordillera Cantabrica. It neighbours the Muniellos biosphere reserve and links up two separate areas of the Cantabrica reserve. With both proposals of the Ancares Lucenses and Ancares Leoneses, Spain is continuing the annual submission of new parts of the future Gran Cantabrica biosphere reserve. Las Sierras de Béjar y Francia, Spain, near the border with Portugal, is notable for the wealth of its resources both ecological and cultural values. The reserve contributes to the revitalization of the local economy with programmes that seek to mitigate the rural exodus. Intercontinental Biosphere Reserve of the Mediterranean, Morocco/Spain. The pioneering initiative of establishing an intercontinental transboundary biosphere reserve is an ambitious challenge. Connected by a marine transition area, the sites in both countries have strong similarities in terms of geology, ecology and cultural heritage. Both countries will thus be able to benefit from each other’s experience and cooperate in managing both marine and terrestrial areas of shared characteristics. Lake Chilwa Biosphere Reserve, Malawi, has particularly rich bird life, with about 164 bird species specifically associated with the Lake Chilwa wetland. Its great diversity of natural habitats and land cover types includes the lake itself, marshes, swamps, five major rivers, islands, a cultivated floodplain and grasslands. Communities around the lake - a Ramsar* site - live off fishing and bird hunting, as well growing rice. Calakmul Biosphere Reserve Mexico, has been extended and renamed to become the Región de Calakmul Biosphere Reserve. It now includes more protected areas of the Yucatan Peninsula, which has among the highest biodiversity of tropical forests of Mexico. The reserve also features important Maya ruins and is considered to be an important part of the Mesoamerican Biological Corridor. Extension to the Shatskyi Biosphere Reserve, Ukraine, The Biosphere Reserve lies in the western part of the largest European swamp-lake-forest complexe – the Polesie Region. The site was extended to the southwest, to the Polish border, and to the north, to the Belarus border, to form a more complete unit for future transboundary cooperation. Commune de Fakarava Biosphere Reserve, France. This constitutes a complete revision of the Atoll de Tairo Biosphere Reserve of French Polynesia. The reserve now encompasses a group of seven atolls: Aratika, Fakarava, Kauehi, Niau, Raraka, Taiaro and Toau. Most of these atolls are inhabited and local communities were heavily involved in designing its zonation, which reflects their perceptions and takes into account local rules governing access and use of resources. Biosphere Reserve of Camargue (Rhône River Delta), France, now covers an area of 193,000 ha corresponding to the biogeographical Delta of the Rhône between Port St Louis du Rhône and Fos-sur-Mer to the east and Grau du Roi/Port Camargue to the west. The new structure of the biosphere reserve facilitates the coordination of the many human activities in the area (rice cultivation, hunting and fishing); ensuring the collective management of water resources; and maintaining sustainability of key natural ecosystems. This Ramsar* site is renowned for its bird population which includes pink flamingos, eight heron and six seagull species. In winter, more than 100,000 wild ducks stop at the site. * Ramsar sites are areas recognized as Wetlands of International Importance under the 1971 Ramsar Convention, which promotes their conservation and rational use.